"Jaume is the third generation of the Alòs family to run this farm in the municipality of Almenar (Lleida) and currently has 400 sows. “When my grandparents moved to Almenar more than 50 years ago, they bought this farm where at first they only had a few sows and cows, and some crop fields,” explains James: “However, 30 years ago my father decided on a change of direction to the family business and specialized in pig production. So, he made a major investment in order to have adequate facilities and start activity in 1985, with a farrow-to-finish cycle with 50 sows”. In 2013, Jaume, after a few years in charge of the farm, decided to carry out an ambitious extension and install new equipment to optimise the way the farm is run. These included the Rotecna Feeding Ball." - How has the farm evolved over 30 years? When my father started the farm in 1985, he had about 50 sows, which soon became a hundred. From there, growth was slow until we had about 250 sows in 2010. Finally, in 2013, after a few years in charge of the farm and with my father nearing retirement, I decided to make new changes and invest in an expansion and and renewal plan for the premises to raise the herd to 400 sows. Then we have two fattening sites as well, which are separated the main farm, one of our own with 700 pigs, and another that we rented a few years ago, with 1,500 more pigs. - Is it very difficult to compete in a sector where the trend is to build bigger and bigger farms? I don't think that it is more or less difficult. More than the size, I think that what matters is the way it is run. If you know how to do things right, you can survive and be competitive, even if you only have a small farm. A large company may have its advantages, but it also has its drawbacks, and same goes for small ones. - What Rotecna products have you installed on your farm? All our floors are mounted with plastic slats, for the farrowing phase we work with the hydraulic heating plate and the Feeding Ball, we also have the TR5, the Maxi Grow Feeder and the Swing R3 in fattening, as well as the different dispensers, among others. - Why do you choose Rotecna products? Because of the assurance that the product will work and the satisfaction that that generates. In addition, the company offers a quality service, and the staff are always willing to help with any doubts. Finally, another of the reasons I like to work with Rotecna is its capacity for innovation. They never stop launching new products onto the market, they always have something new to offer. - What Rotecna products would you highlight for the benefits that they offer? The Swing R3 is a very efficient hopper for fattening, with which we recorded some very good feed conversion rates per pigs. In addition, feed wastage is minimal, so it is very cost-effective. In terms of handling, it is a hopper that works very well and is easy to use. 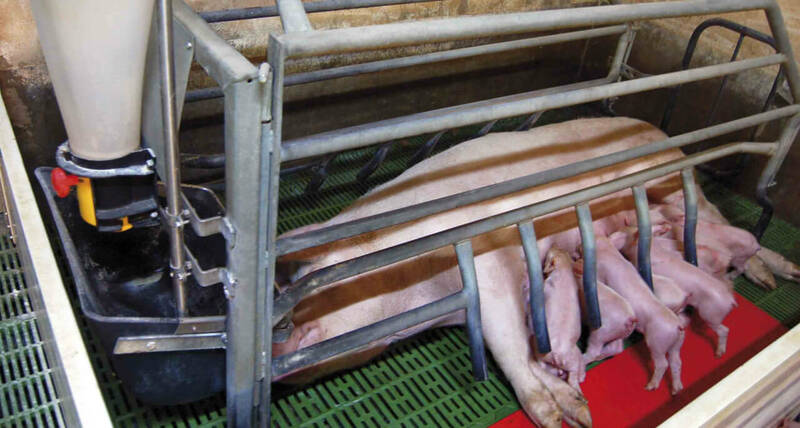 And one product that brings comfort and hygiene is the 600x800 mm slat for mothers, which we have installed in our farrowing pens. - You have installed the Feeding Ball in your farrowing pens, why did you decide on this product? First, you must note that we work with manual feed, so when we expanded the farm, we sought a solution that would allow us to keep our system of working, but to make improvements, so as not to have to be constantly worrying about feeding the sows. So we decided on the Feeding Ball, which allows the sows to eat in small amounts throughout the day. - What benefits can you highlight regarding its use in farrowing? One of the main advantages is that with the Feeding Ball the sows don't lose weight in the summer. Keep in mind that, with such high temperatures, the sows barely eat during the day and concentrate their intake at night, which made it difficult for us to manage, because at night there are no staff on the farm and our feeding system is manual. So, thanks to the Feeding Ball, we have been able to solve a problem that was quite serious for us. Now, in the summer, before we go home we leave the hoppers full and the sows have enough food to eat at night when they are hungry. Also, although during the first few days after birth, we restrict the amount we feed to the sows in order to control the kilos of feed they have to eat, from ten days after birth we opted for ad libitum feeding, so that it is the sow that manages her own food depending on her appetite, which has provided us with several benefits. First, we've increased the amount of food the sows eat during their time in farrowing pens by half a kilo per day, which benefits milk production and good piglet growth. Also, since the sows eat more, they are heavier when they come out of farrowing and hence better prepared for the next breeding. In addition to these advantages, we should also add that feed wastage is minimal. - What do you view as the future challenges for the sector? Export is a key area in order to maintain the current volume of production, for many years now we have been producing more than we consume. Also, the sector has other issues to deal with, such as the management of slurry and nitrates. The implementation of new environmental policies is going to be an ongoing battle in the next few years. - Finally, what future challenges does the farm face? Our main objective is to get the most out of the investment made and to consolidate the farm within the sector. We are also working on the optimization of our production costs to safeguard our future. More in the long-term, once we have achieved a certain stability, we are thinking of expanding again, even though it is difficult, mainly because of the problems with managing manure. "